Back aboard the Aurora Australis, Sunday, I can start to assimilate and look back on my experience. Friday was again too gusty to fly or go outside much, but Saturday was fine and clear, and helicopter operations got into full swing. 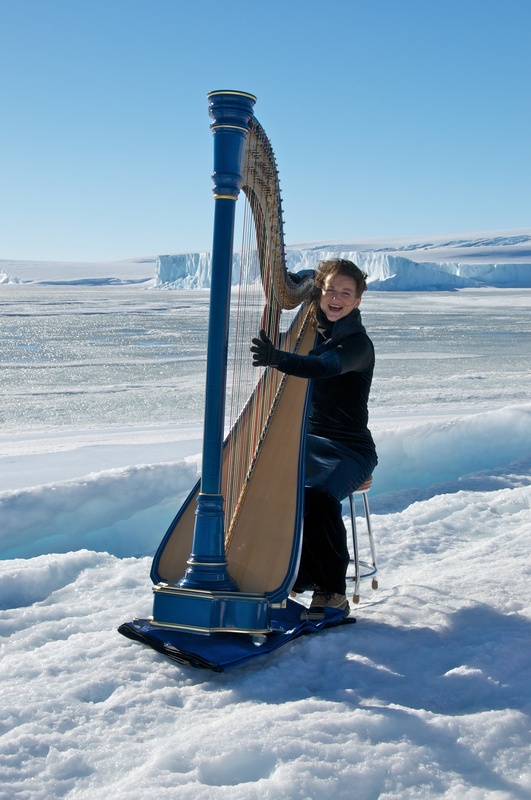 Highlight of the day was a very adventurous photo shoot – an opportunity we didn’t want to miss with my blue harp on the ice. Concerts over, I thought it worth the risk: a once in a lifetime opportunity. Temperature was around -7C, and by the time we got going the wind was 30knots, which equals a Windchill factor of about -20C! I put my thermals on under the evening gown, a scarf, woollen gloves and snow boots with boot chains while Tom and Martin researched a suitable ice shelf on the edge of the bay. Then Chris gingerly manoeuvred the ute with harp on down over the rocks. Everything went pretty quickly because I wasn’t sure how the harp would handle it, and my ears started freezing off, but I am looking forward to seeing the shots. Later in the day the winds eased back again considerably, and I would probably have really been able to play out there – but in Antarctica you have to take the windows of opportunity offered and not count on anything as it’s never exactly what you expect. They call it the “A factor”. I hardly dared check on the harp once we got it back – I let it acclimatise in the cold room first and got myself a cup of tea – but when I checked the tuning it was bang on pitch – not a bit sharp and seemingly unconcerned! In the afternoon the ceremony for the interment of the ashes of Phil and Nell Law was held – unfortunately inside because of the gusty weather, but it was a nice ceremony in the same location as I had presented my concert, with the view of the bay behind. I played Sitsky’s Fantasia ‘Antarctica’ and ‘Dark Eyes’ which was Law’s favourite piece to play on the accordion. Later I was treated to a trip up towards the plateau behind the station in a Haaglunds (Haags for short) a mixture between a tractor and a snowmobile. The sun melting the top layer of snow and the cold wind meant that the vehicle soon started to slip and slide, and eventually we got out before the summit for a walk. The surface was very beautiful, with glimpses of clear blue frozen water beneath the white surface. Tricky to walk on even with boot chains (these are like car snow chains and fit snuggly over the bottom of your snug Canadian snow boots), in some parts the surface was sheer ice with only little ridges to keep one from slipping down the large sweep to the bay below, or so it seemed. A sensational view over the icy bays and rocky outcrops in the only sunny day of the stay, the icy bay reflected blue as though it were melting. This entry was posted on Sunday, March 6th, 2011 at 2:38 pm	and posted in Uncategorized. You can follow any responses to this entry through the RSS 2.0 feed. Hi Meriel – I took it outside on the ute and in the helicopter in the heavy duty one piece travel cover, so I think that protected it from the wind really well. I was afraid the colour might crack but it all still seems quite fine. Jakez was very impressed with your Camac glamour shot – we saw him in Tassie at Harp Island this weekend and played some of his pieces in the ensemble. Love from Philly. Hi Philly – hope you had a good time there. It was beautiful to have all that blue and white for those photos, and you can see I was having lots of fun I think – something I often forget about every day with the harp! Poor instrument. Even for Camacs, which are not from massive wood, but mostly veneers, such temperature/conditions change even for 10 minutes is pretty rough. Hi – luckily the instrument was tougher than I had even counted on, and seems to have come out unscathed apart from an electronic cord which I seem to have pulled. I checked with Camac Harps beforehand and understood that the main issue would be sudden change, so I was very careful about cooling down and warming up stages. Time in minus temperature was quite minimal. The tough travel cover also insulated it a lot because the cold was mainly from the wind. Then again, you have introduced an interesting question about instruments – to a certain extent I see an instrument as just that – a means to a creative end, rather than an object in itself. This attitude might raise a few interesting dissussions amongst harp circles…. ?